We all love visiting stately homes; admiring the soaring ceilings, bold décor and the spectacular opulence fit for royal residents and aristocratic families. 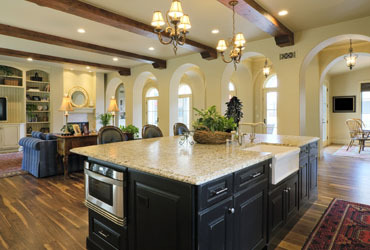 With a few tips and ideas, you too can live the country manor lifestyle! Admire the stately home design in your own home by incorporating a few interior décor features influenced by beautiful traditional properties. Block wall colours and neoclassical wallpaper are common features in stately homes, exuding decadence in the fine detail and rich colouring. Adding a bold block colour or patterned wallpaper to your interior will create impact and depending on the colour choice incorporated; it can appear either subtle or dramatic in effect. The colour hues chosen will determine whether your room will appear warmer or cooler in tone and therefore influence the accessories and features encompassed to complement the aesthetic. Vibrant shades in red and blue are common place in traditional stately properties; influenced by the trends of Eighteenth and Nineteenth century design. Add sophistication to the interior with patterned floor runners, rugs or carpets fashioned in the tone range of the dominant wall colour. One of the main features that you notice when walking around beautiful stately homes are the elaborate and large curtains fitted to the window structure. The curtains often appear as though they are crafted from thick, heavy fabric; acting as luxury insulators as the hemmed tassel fringe material elegantly drapes down to the floor. Tasselled cords and textured rope are used to grip the curtains to the wall during the hours of daylight and are then released at night to retain the warmth of a wood burning fireplace. Cleverly create the stately home look by adding hand crafted fabric upholstered chairs and sofas to the room adorned with softer furnishings such a mirrors, elaborate art frames and ornaments in a brass finish. A mix of chandelier lighting fixtures, floor lamps and table lamps will add visual depth to the room whilst intensifying the indoor brightness. Embellish your home with Eighteenth century style sculptures and art pieces to convey authenticity and a touch of upper class perception. To obtain an authentic traditional interior, it's important to choose and embroider doors, drawers and cupboards with hardware that suits the manner of the room. 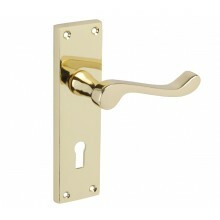 Door handles on backplate are sprung lever handles that sit on backplates and are a familiar feature in traditional properties. 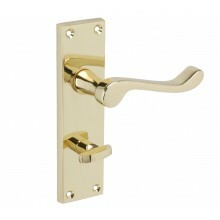 Polished brass door handles are a popular choice as the warm metal hue creates a reflective glow and a sense of visual thermal insulation as the fireplace roars. 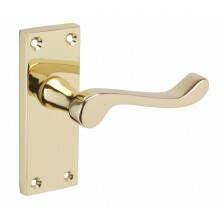 A scroll lever design will offer sophistication and style whilst providing the user comfort in operation. You’re on your way to creating the illusion of residing in your own stunning stately home, however the appearance of modern technology can quickly destroy your hard efforts for a truly traditional property. Make sure to incorporate storage facilities, such as TV cabinets and desks with drawers to conceal your entertainment systems, laptops and other smart devices that may ruin the allure of the stately home style. For drawers, wardrobes and storage systems, knurled brass drawer knobs offer the perfect blend of a classic finish and high quality performance to ensure aesthetic legitimacy and ease in functionality. Follow these simple tips to create your very own stately home! We offer a variety of high-quality products that excel in both aesthetic and performance to help make your styling decisions easier. Now go forth; decorate and reside like an aristocrat!